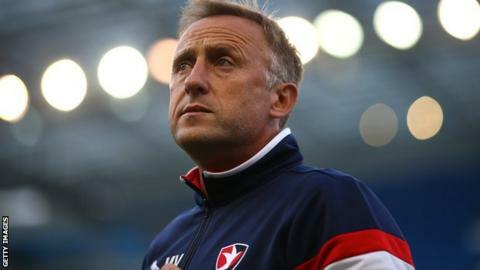 Newly-appointed Crawley manager Mark Yates has admitted he stayed at former club Cheltenham Town for too long. The 45-year-old spent nearly five years in charge at the League Two side before being sacked in November. He signed a two-year deal with Crawley, who were relegated from the third tier on the final day of the season. "I was probably there a little bit too long. I had a couple chances to move on and for whatever reason it didn't happen," Yates told BBC Radio Sussex. "I certainly didn't want to see them (Cheltenham) go down and I'm desperately sorry that they have, for everybody there." The Robins were 18th in League Two when they parted company with Yates, but went on to be relegated to the Conference. Paul Buckle and Russell Milton also had stints in charge at Whaddon Road before current boss Gary Johnson was appointed last month. "When I left them they weren't in the position they ended up in, but that doesn't mean I'm absolved from the blame," Yates added. "When I was at Cheltenham over the last couple of years I've had some really good times working on a pretty restricted budget, but felt we overachieved, and I was probably a victim of my own relative success."